Sometimes, we all fall into a mood where we just want to spoil ourselves with something special; something that makes us feel royal; something that, by far, differentiates itself from the norm. 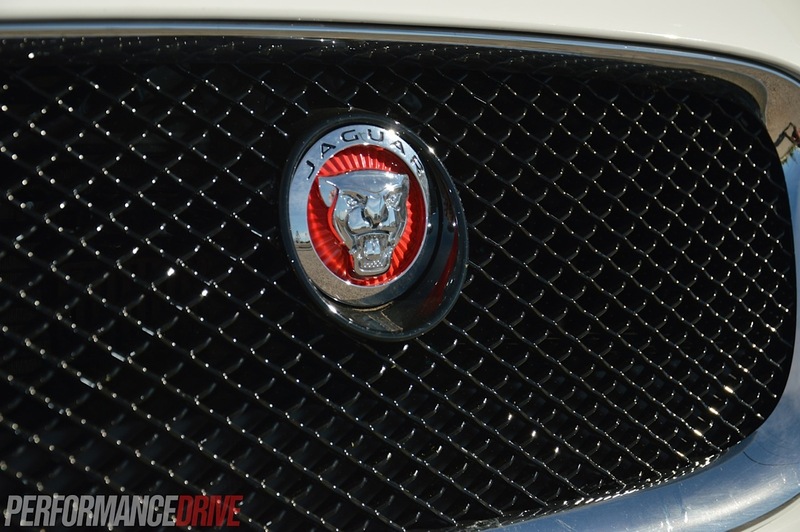 Well, among the business of cars, Jaguar truly knows how to make you feel this way. 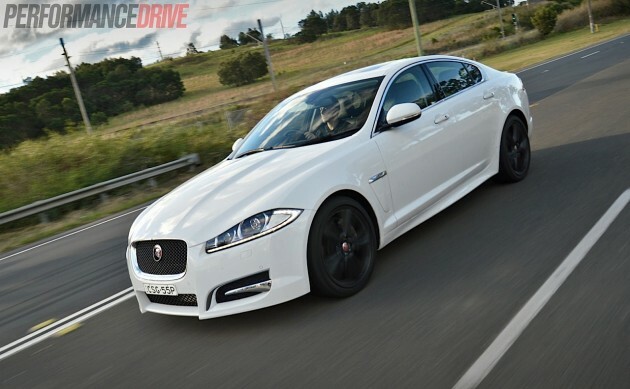 Can the 2014 Jaguar XF S Luxury 3.0DTT do the same? There is a wide range of XF models available at the moment, spanning from the fantastic value 2.0-litre turbo petrol to the range-topping XFR-S with its monster 405kW supercharged V8. 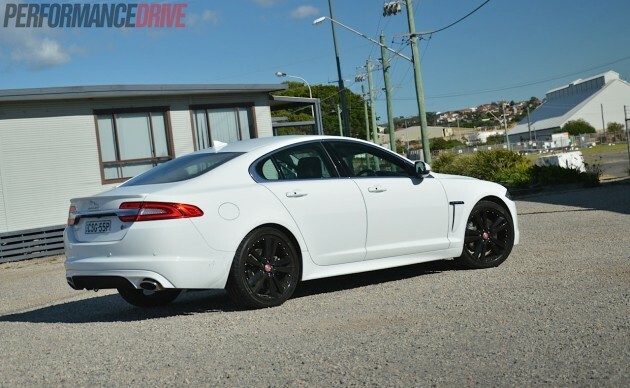 Today, we’re putting the XF S Luxury 3.0DTT (3.0-litre twin-turbo diesel V6) to the test. 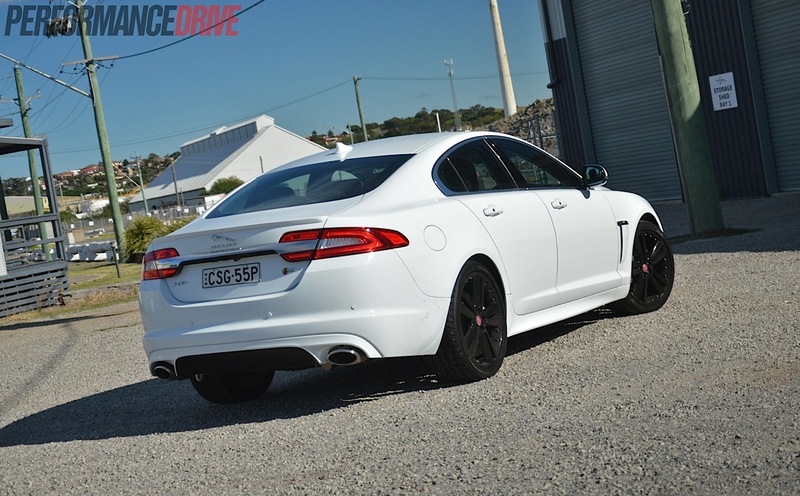 It produces a healthy 202kW of power and an enormous 600Nm of torque. Prices start at $95,900 (excluding on-road costs). Despite the seemingly high price tag the Jaguar XF is actually one of the more accessible options in this segment. This is especially noticeable when you compare it to its direct competitors. 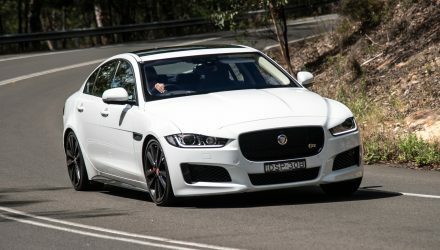 The entry-level XF is ten grand less than the 5 Series/E-Class/A6 institution, and even this mid-spec S Luxury is over $10k less than its nearest high-powered diesel rivals; Audi A6 3.0 TDI ($108,400) and BMW 535d ($122,400). Being one of the biggest brands in luxury, it goes without saying that you get a huge list of features and creature comforts in the XF as standard. You get all the usual stuff, like rain-sensing wipers, auto everything, front and rear parking sensors, reversing camera, sat-nav, DVD player, paddle shifters and many other extras. But it’s the fine touches of class that set this baby apart from the rest. Like the impeccably comfortable and plush leather seats, to the attention to detail in the wood grain finishes, the theatre room-like 10-speaker sound system, and the unmatched craftsmanship that goes into the metal knobs and switchgear. 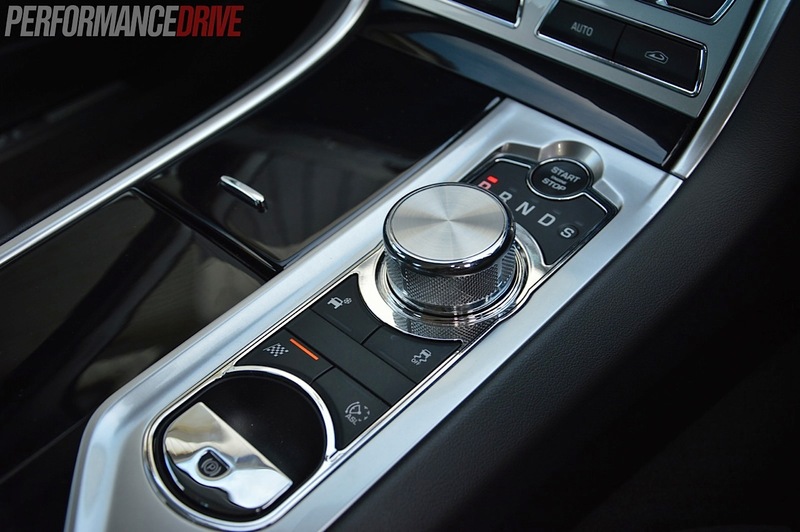 We especially love the fancy sinking gear selector knob, which majestically raises in and out of the centre console as the car turns on and off, and the cool air vents that rotate away into the dash when not in use. 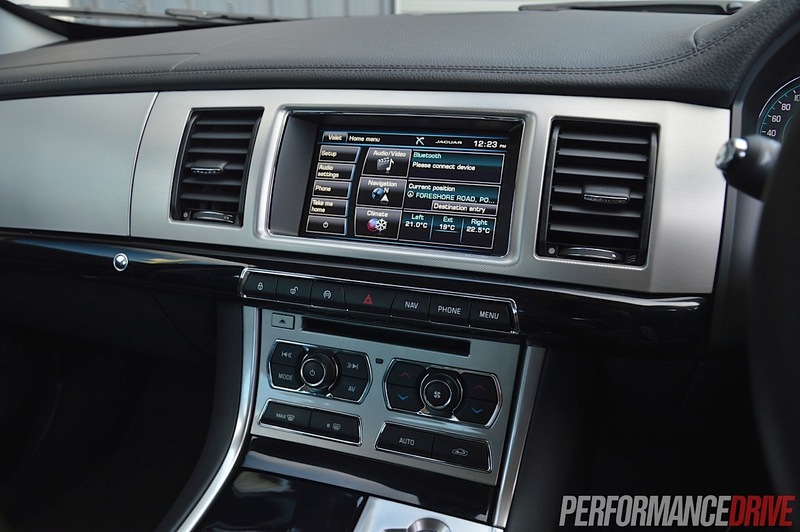 Aside from the luxury, the Jaguar XF is huge inside and makes for a perfect car to stretch out in and enjoy a relaxing drive. 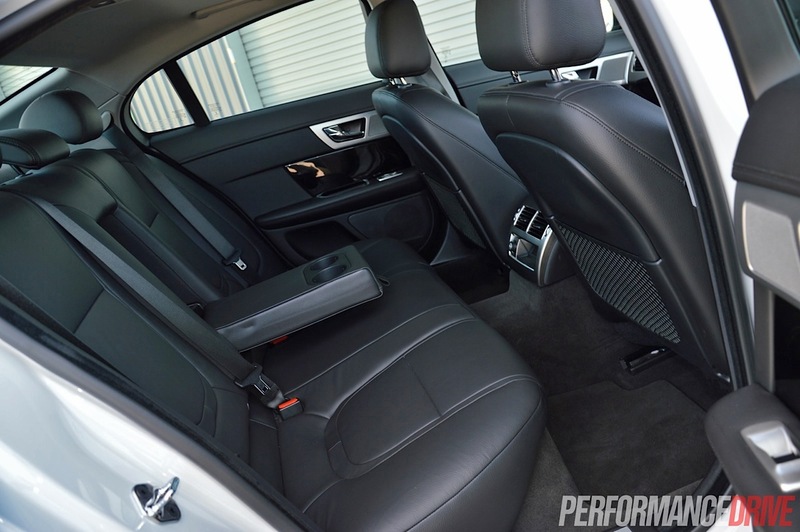 The front seats are perfectly-bolstered and are among the most comfortable in the business. 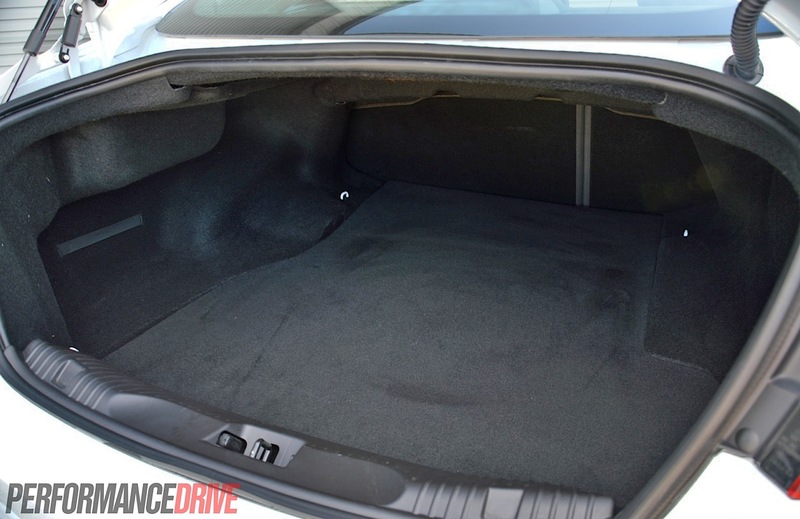 And unlike what is experienced in some of the competition, the rear seats supply an equivalent amount of comfort as the front seats. With that, don’t assume that boot space is compromised either. There’s more than enough room to carry the family shopping or even airport luggage for all occupants. 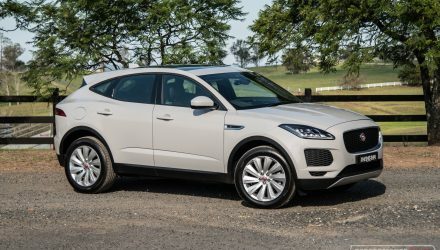 It’s rated at 500 litres, or 540 litres if you opt for the Jaguar Tyre Repair system instead of the space-saver wheel. 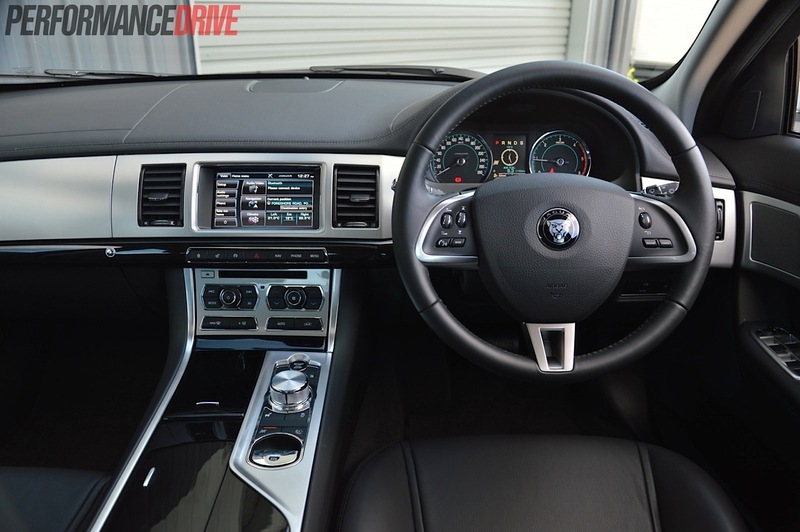 All of the driving systems and features are simplistically laid out for a user-friendly experience. Buttons and menus are positioned in sensible locations, and we found navigating through them to be particularly easy to grasp. However, we couldn’t figure out how to make the interior lights automatically turn on and off with ajar doors – although, we are sure there’s a way. 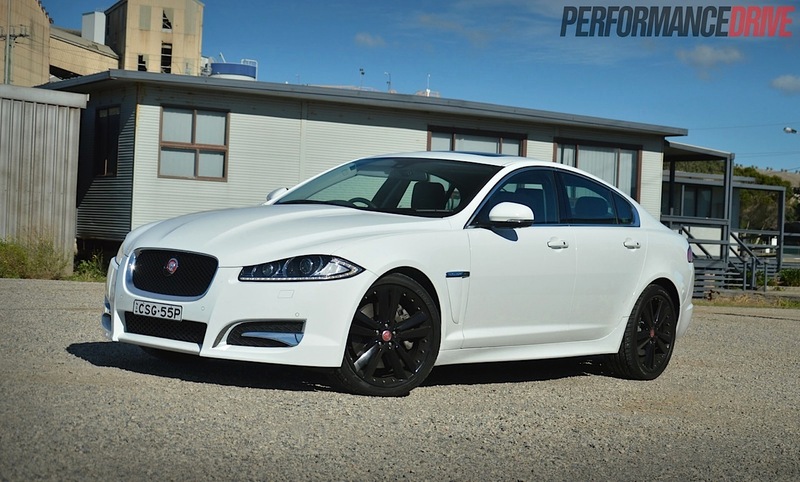 Even with the Jaguar XF’s standard six airbags, reverse parking sensors, a pedestrian contact sensing system, stability control, anti-lock brakes with cornering brake control and electronic brake force distribution, it scores only a four-star ANCAP safety rating. All other rivals score the full five stars. This is a bit disappointing for a car that’s only been around since 2010. Something that couldn’t possibly pass you by and really wins us over is the Jaguar XF’s immensely elegant appearance. After one little glance you immediately understand everything the XF stands for. The design takes on a fluid philosophy where each panel flows consistently. 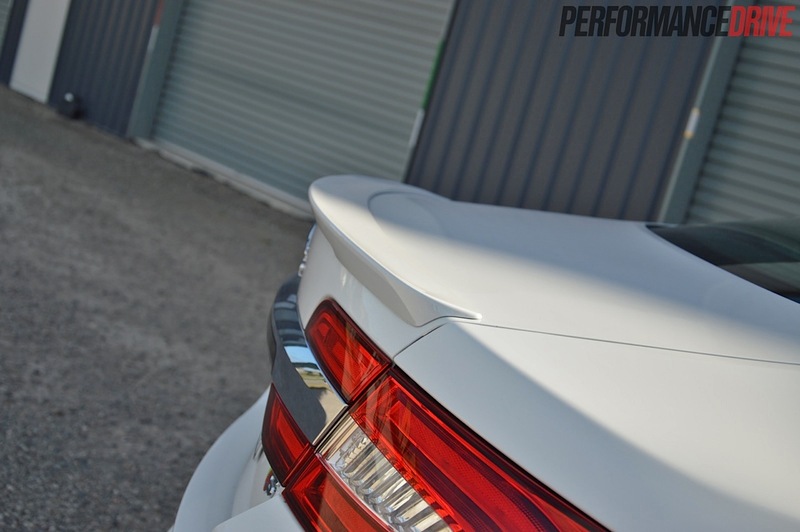 Curves and ridges blend in with every surface and every panel sits close together for a real high-quality look, like the entire car has been milled from a single billet. The headlights are shaped with a distinctive frowned curve, underlined with dotted LED daytime running lights which give off a determined yet pretty face. At the back the taillights are beautifully connected by a thick chrome bar which helps to convey strength and prestige. It is, in our opinion, the finest-looking proposition in this segment. 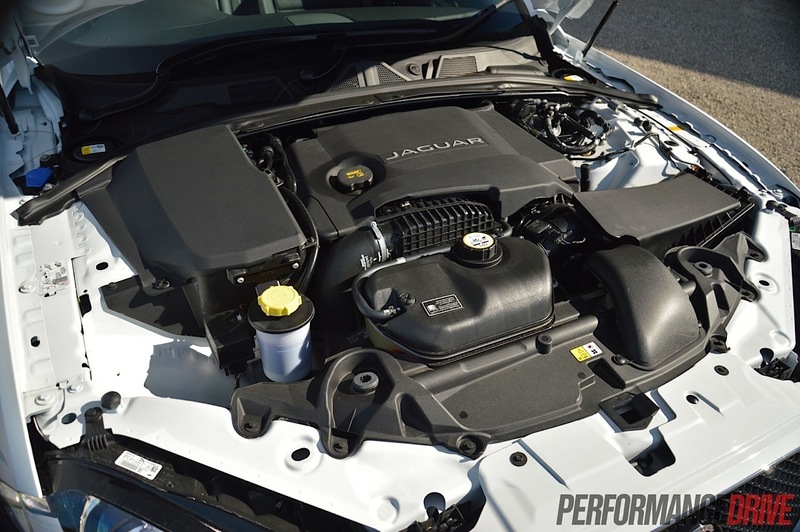 The Jaguar XF has so much good stuff going for it, we’re struggling to find any dirt. And it’s just the same on the road. To be frank, there are many cars out there that either have powerful engines, economical engines, smooth transmissions with a million gears, handle like they’re on rails, or provide floating cloud-like rides. 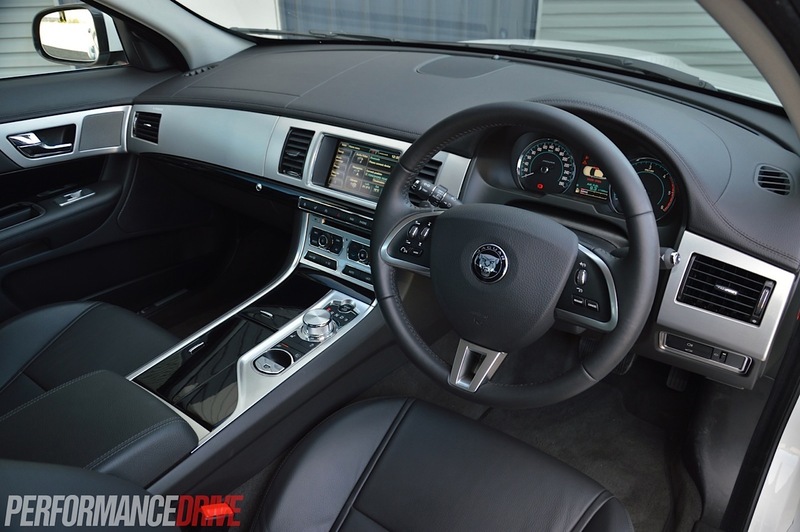 But the stand out with the XF is that it ticks absolutely every box; it’s the delivery of all these important attributes that make for a truly luxurious drive. 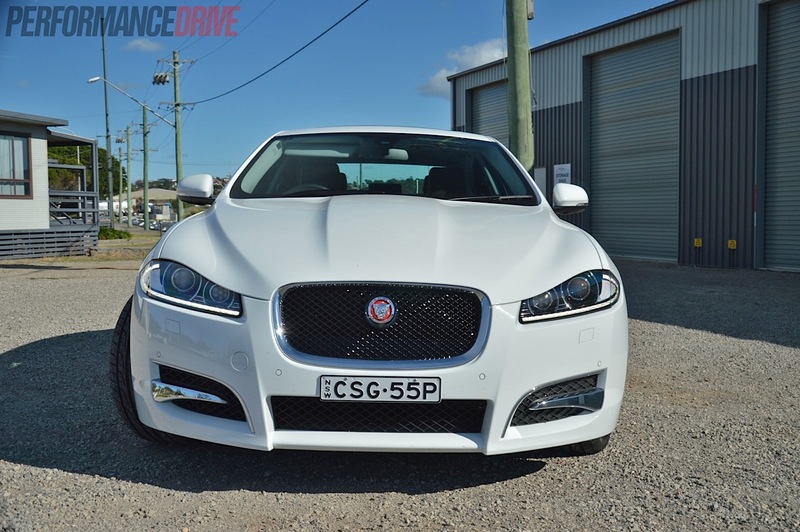 The V6 diesel is a new addition to the XF family, and highly welcomed. Peak torque of 600Nm is available from just 2000rpm, which means it cuts through the air and steams up hills like a friction-free rocket in outer space. Even with a full car, there’s never a time when it feels like it’s struggling. It is superbly effortless. The diesel gives off a subdued V6 roar too, with very little evidence of the traditional diesel clatter and knock. Although the engine is rated at 202kW, it doesn’t feel like 202kW. When you plant your foot to the floor the car takes off in such a calm, collected and non-aggressive way, there’s simply no drama. You often check the speedometre and find that the car is well and truly up to speed quicker than you thought. This is all part of the luxurious and refined Jaguar experience. We timed 0-100km/h just 6.0 seconds. On top of all that, the engine is extremely economical for its capacity. Official figures read 5.0L/100km on the highway, and 6.0L/100km averaged out. During our test, which often involved being a little heavy on the throttle, we achieved an average of 7.2L/100km in mixed conditions. Our test model was fitted with stop/start technology, where the engine automatically switches off at the lights. Maybe the engine is a little too big for this feature. We experienced quite a delay once the engine restarted and settled into a smooth idle compared to other smaller capacity engines using a similar feature. You can turn it off if it bothers you. The shifts from the ZF eight-speed transmission are so smooth they are almost undetectable, which makes a huge contribution to the overall smoothness of the XF. 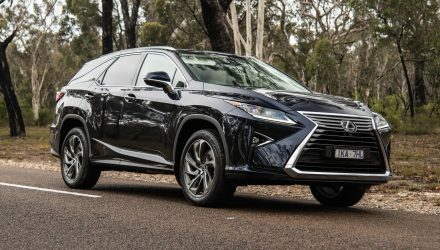 There is a slightly annoying reluctance to kick-down to a lower gear when tackling long climbs on the freeway in standard ‘D’ mode, resulting in a momentary delay in acceleration. But it’s a characteristic that disappears when ‘S’ mode is selected or when the steering wheel-mounted paddle shifters are pulled. Adding to that overall confidence and composure is the car’s dynamic handling qualities. Jaguar has struck a perfect balance between ride and handling with the XF. There’s some very slight body roll when pushing hard into corners, but it never feels unsettled or nervous. Furthermore, even sizeable lumps and bumps are completely ironed out to deliver an exceptionally supple ride, and that’s with the optional 20-inch black Kalimnos alloy wheels ($2080) – 19-inch standard. 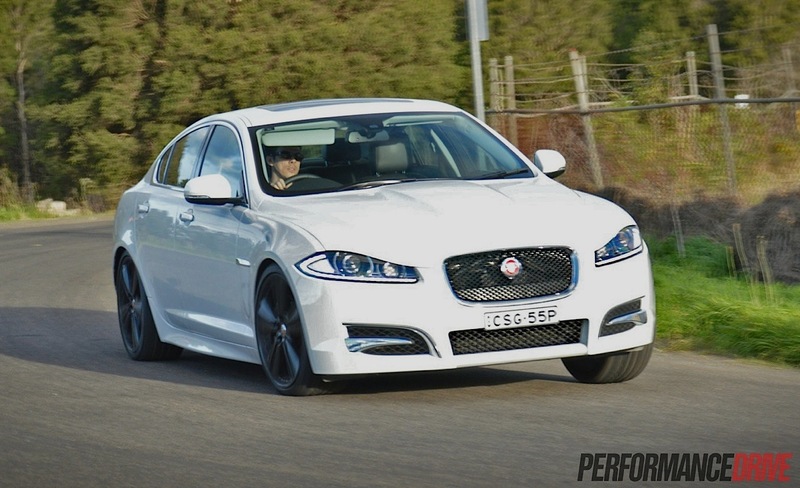 It looks like Jaguar has fixed its common overly light steering traits with the XF. Particularly in those more enthusiastic driving moments, there is a little more weight and accuracy from dead centre, which helps improve feel and response. It’s a nice steering setup and certainly well-matched to the rest of the vehicle’s personality. Perhaps the only downside to the handling is the Dynamic mode. 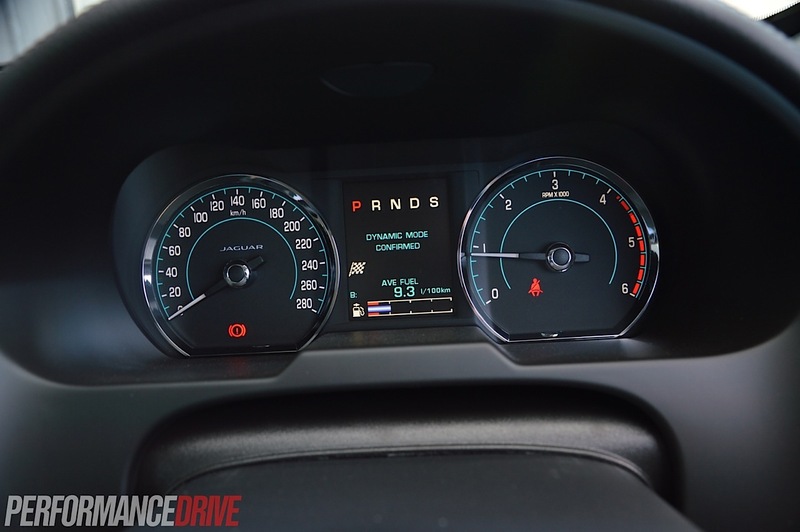 This sharpens up the throttle response and the transmission’s eagerness, but it doesn’t do much for tightening the handling. The fact that it is one of the heaviest vehicles in this segment also plays a part when the road gets really tight and twisty. 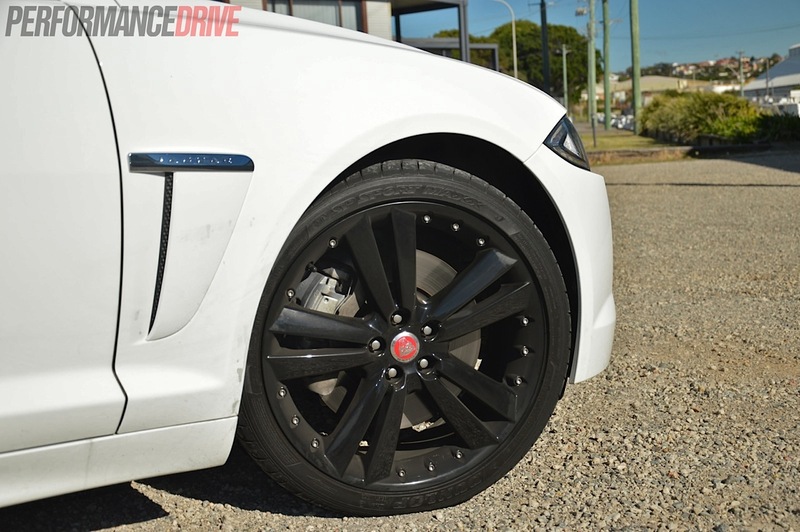 If you’re in the market for suave car that radiates luxury, prestige and comfort, then be sure to take a long, hard look at the Jaguar XF S Luxury. There are loads of fine touches and surfaces inside and out that will constantly remind you how royal this wild cat is. With a refined twin-turbo diesel V6 engine combined with a silky smooth eight-speed automatic transmission, it puts it high up on our recommendations list. Not only do you get loads of power and torque, you also get marvellous fuel economy for the performance on hand. Add to that a decent starting price (for a true luxury contender) and you’re left with a competitive and compelling package. Though, be weary, the final price will rise quickly if you get too excited by the tempting optional extras.